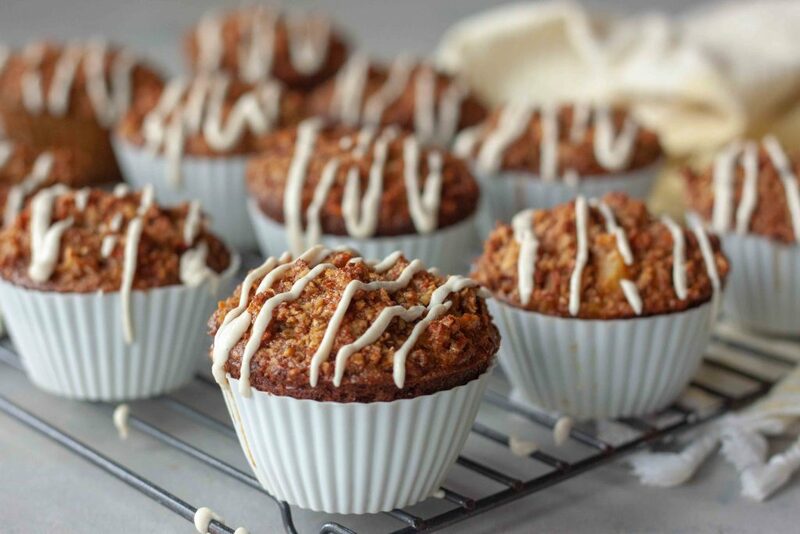 Can’t hold out sharing these Carrot Cake Oatmeal Muffins with Cashew Cream after posting a sneak on Instagram because they were so insanely delicious and getting numerous messages and request for the recipe. Even making time for one more test batch so I could get them post for you today. 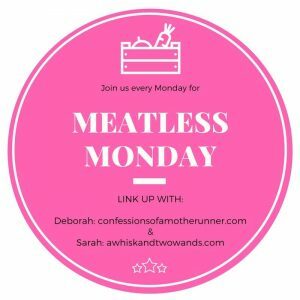 I wasn’t planning on sharing them until next week or the following week but you asked for you asked for it and they’re so good I can’t keep you waiting. 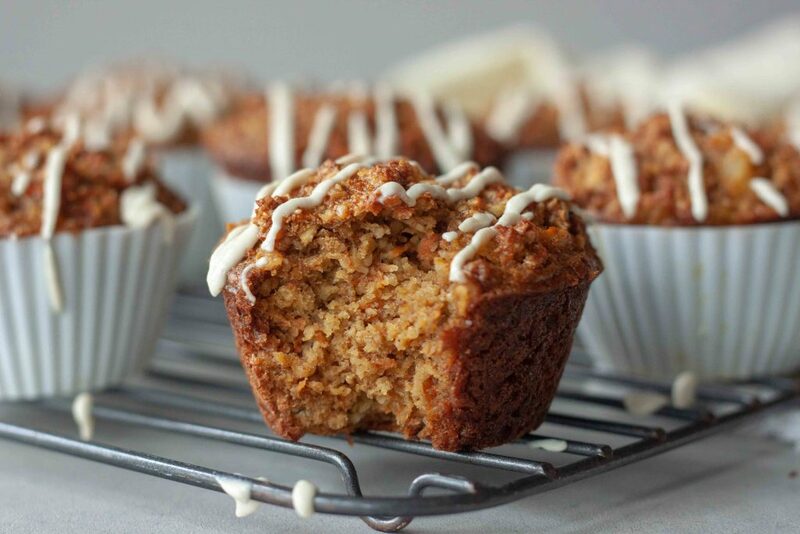 I’ve been wanting to make carrot cake muffins or carrot cake bread for a couple weeks now and tweaking a recipe I made with A when she was younger. I haven’t been in the kitchen much since Baby G was born. 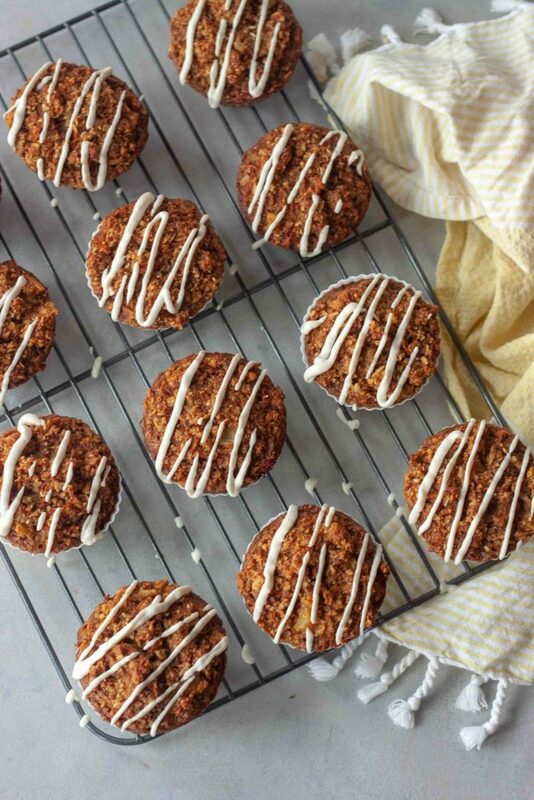 Last week I had an hour of time “to myself” and instead of taking a shower, doing something relaxing, or doing one of the millions of things on my to-do list like finish my little stud muffins birth story or the numerous things I have to do for his baptism, I ran to the kitchen to make these Carrot Cake Oatmeal Muffins with Cashew Cream. I figured the family would enjoy them, as would I, for breakfast and could test out my tweaked recipe. The big debate in our house… raisins and nuts! Really not sure why I even asked them. I of course wanted to add chopped walnuts but the girls didn’t want them. I’m ok with that because there is texture in them already and they have the cashew drizzle. Raisins… I know they aren’t always in carrot cake but I’ve had them in it before and in carrot muffins, the rest of the family told me nope they don’t belong in carrot cake. So there are no nuts, you can add them if you want, or raisins in these muffins. I figured the recipe would turn out but might need minor tweaking but nope they were seriously so delicious, especially with the dreamy Vanilla Cashew Cream! Thinking maybe it was just me and being a little sleep deprived I waited for the family to try them. They agreed they were yummy! Just to be sure I tried one without the cashew cream. Then made another batch to make sure it wasn’t a fluke, it wasn’t. Oh and then we enjoyed them completely frosted with cashew cream! Either drizzled or frosted the choice is yours. Of course the only photo I got of them completely frosted is one I shared on Instagram from my phone. In order to make it in a Vitamix you have to make the amount listed which will cover 2 batches if you drizzle or 1 if you completely frost them. 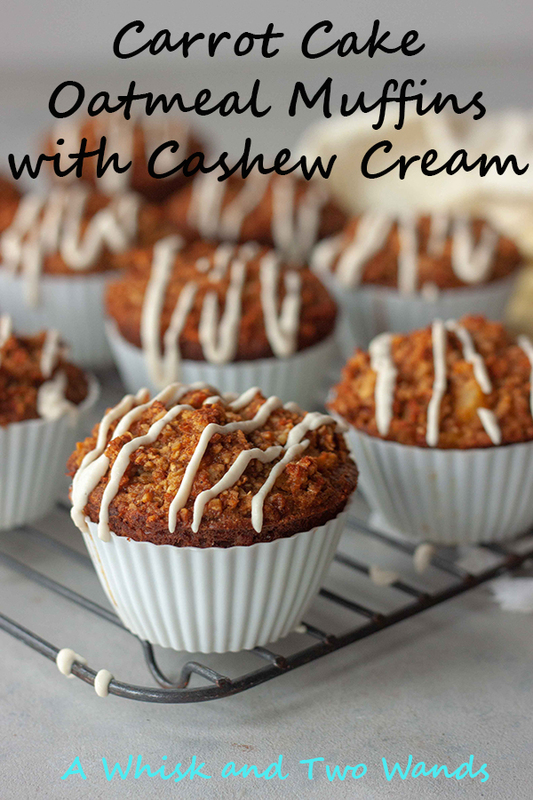 Trust me you’ll find other ways to enjoy the cashew cream if you decide to only make one batch and just drizzle. Great with berries or you can do what I did….made carrot cake pancakes and added a little more maple syrup to leftover Vanilla Cashew Cream and drizzled it over my pancakes! Yes, yes I did! 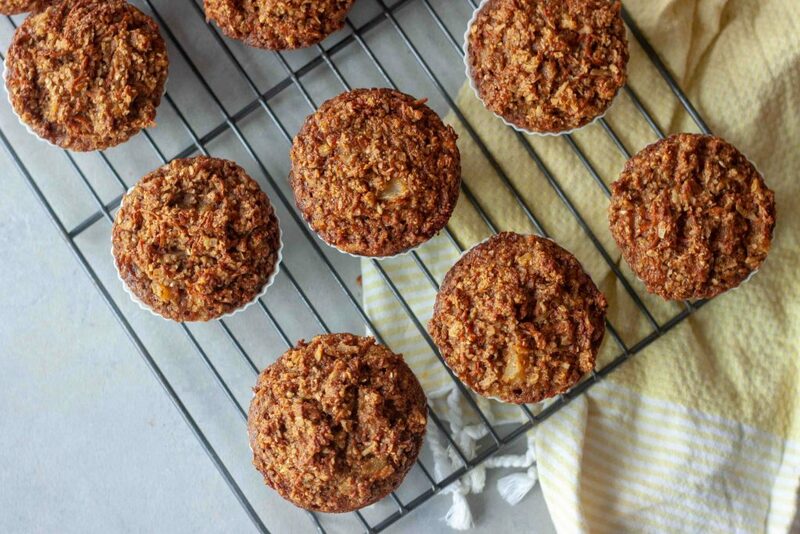 If you’re still looking for a reason to make them it’s a great way to get some veggies in for breakfast or get your kids to eat their veggies. Haha yes that just might be what I tell myself when enjoying another. Seriously never expected to be more hungry after giving birth but nobody warned me about how hungry I’d be while breastfeeding. Just listening to my body and still haven’t even stepped on a scale but figure since my pre pregnancy jeans fit before Baby G was 2 weeks (a little snug but they button and aren’t uncomfortable just not as loose) I’m not going to stress or overthink it. If only my other two pregnancies years ago were this easy. I don’t think my pre-pregnancy clothes fit when the girls were even a year old. Trust me it isn’t all as glamorous as it might sound, I haven’t washed my hair in a few days and most of my clothes (tops) don’t fit for other reasons. Back to the muffins! They’re gluten free, just use gluten free oats, and dairy free. If you need nut free you can omit the cashew cream and add cream cheese frosting or enjoy them without anything on top. If you do try another topping you’ll have to let me know how it goes. 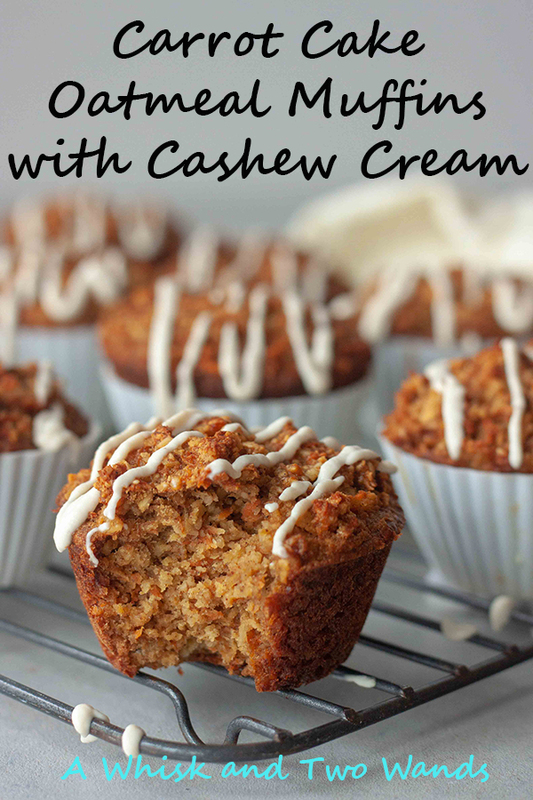 Gluten free and dairy free Carrot Cake Oatmeal Muffins with Cashew Cream are a delicious and healthy breakfast. Easy to make and every bunny will love them! Soak cashews for 4 hours or overnight, you can also make the Vanilla Cashew Cream a day or two ahead of time. If frosting instead of drizzling cashew cream it is thicker if you make and chill the cashew cream ahead of time. Combine cashew cream ingredients in a Vitamix, or high-speed blender, and blend until smooth scraping the sides as needed. Store cashew cream in the refrigerator until ready to use. Using a food processor, I used a mini one, grind oats to a medium to course ground texture. 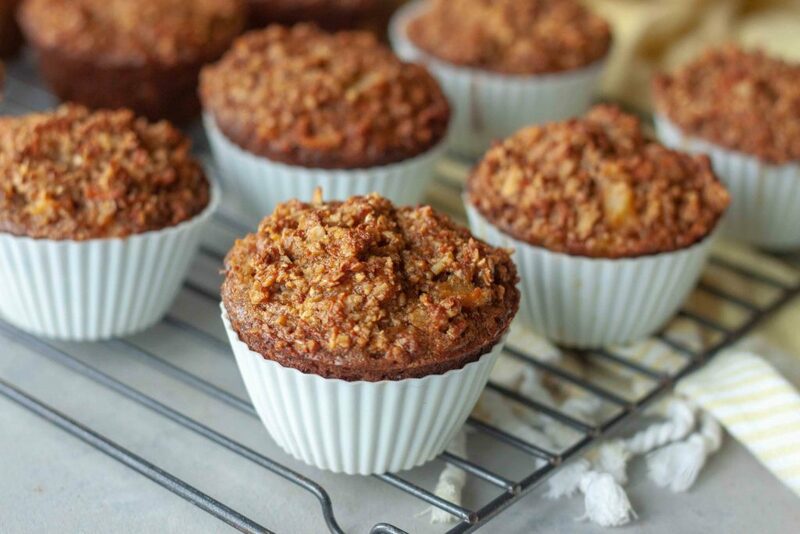 In a medium bowl combine ground oats, cinnamon, nutmeg, all spice, baking powder, baking soda, and salt. Set aside. In a large bowl combine eggs, honey/maple syrup, palm sugar, coconut oil/butter, and vanilla with a hand mixer or whisk. Add the dry ingredients into the wet and mix until just combine. Using a spatula fold in grated carrots, pineapple, coconut, and optional walnuts. Spray muffin tin or line with liners. Spoon mixture into muffin tin, about one slightly heaped ice cream scoop if using one. Bake for 25-30 minutes until set and toothpick comes out clean. Let cool slightly before removing from pan and cooling completely on a wire rack. 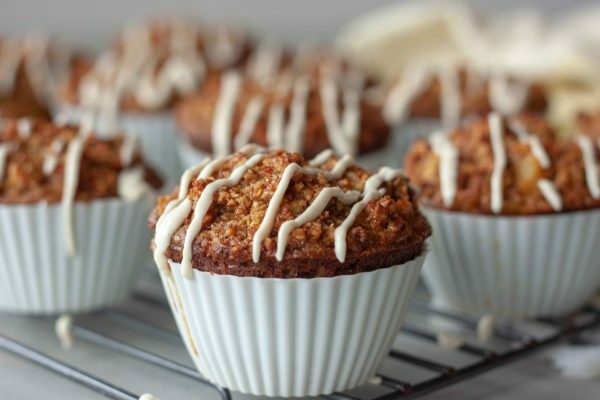 Drizzle or frost muffins with Vanilla Cashew Cream. Like it, PIN it or later! Yum! I love carrot cake baked goods!